Bug Central aims to eliminate toxic pesticides from the home garden by the identification, development and commercialisation of environmentally friendly alternatives. 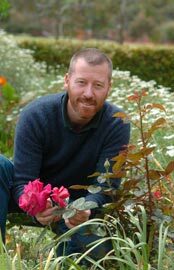 Stuart Pettigrew, the founder of Bug Central, has worked in the horticulture industry for more than 25 years. He has worked in various consulting and production roles in commercial horticulture. During this time he has seen both the damaging effect chemicals can have on the natural balance of growing systems, but also some of the improvements ‘thoughtful’ pest control can achieve. Bug Central is backed by a number of Australia’s leading commercial suppliers of beneficial insects. These products, and sound practical experience allows us to solve most common pest problems encountered around the home. Farmers have long understood that it is both uneconomic and unsustainable to use only chemical pest control options. Industries such as citrus and apples have led the way with Integrated Pest Management, and the use of beneficial insects. Many of the products that help achieve this balanced control have only ever been sold in ‘commercial’ quantities. Bug Central now makes them available in affordable and easy to use home packs. Launched in Adelaide in October 2004 by Stuart Pettigrew, Bug Central provides a range of products and services to eliminate the need for harsh pesticides in home gardens around Australia. Since that time, our product range has grown and we can offer a 'soft' solution for many of the most common garden pests. Stuart also has a passion for promoting sustainable horticulture and food security through smarter resource use. He has worked on major projects in Australia, Asia, Africa and Europe in areas such as water resource management, food security and of course pest and disease management.